We have so much information available to us about what is happening on our websites, we can see what our visitors are doing, which pages are most popular, where their eyes travel first and which keywords are getting them there, but which pieces of intelligence are most valuable and how can we turn this information into physical leads and sales to prove ROI from our investment in analytics tools? 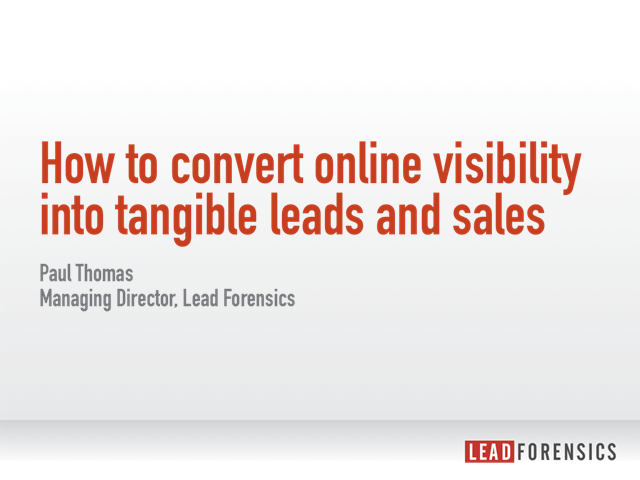 Paul Thomas, Managing Director of Lead Forensics, talks about how his clients are taking their online analytics one step further and uncovering web leads they didn't know they had. Hear how leading B2B businesses are maximising their return from their online investment and are driving more leads and revenue from their digital campaigns than ever before. The webcast includes a 20 minute Q&A hosted by B2B Marketing's editor.